Hermle offer the SELSEY 35066-000132 Ships Bell Wall Clock,in a nickel finish. 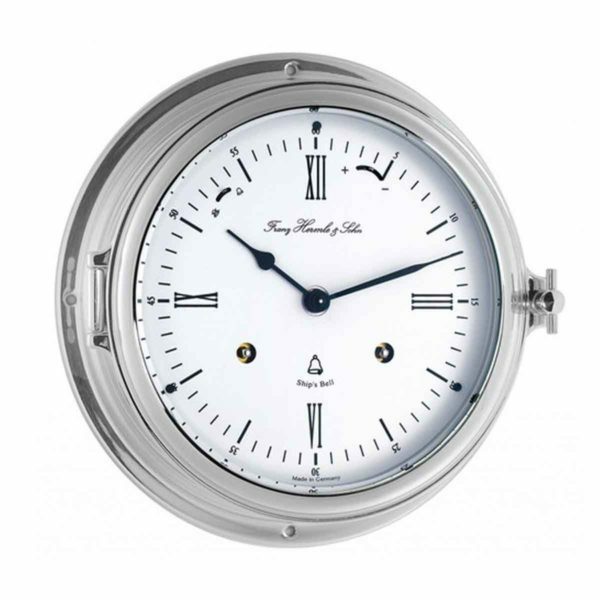 A Nautical ships bell clock with solid brass – nickel plated bezel, and a double time track showing the hours in Roman numerals together with a numerical minute display. Free delivery to any UK address. BilliB can delivery many popular clocks within a few days, however for some clocks – ordered from the manufacturer, it can be one to four weeks. Hermle offer the SELSEY 35066-000132 Ships Bell Wall Clock,in a nickel finish. A Nautical ships bell clock with solid brass – nickel plated bezel, and a double time track showing the hours in Roman numerals together with a numerical minute display. Free delivery to any UK address. Hermle clocks are ordered from the manufacturer, normal delivery is within seven working days, on occasion this can be extended due to available production stock.